L: 132.5" x W: 117.5" x H: 39"
Rockland 6-pc. 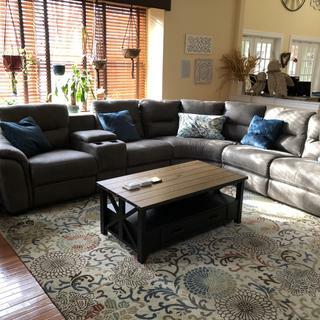 Microfiber Power-Reclining Sectional Sofa w/ Storage Leather-look seating with easy-care fabric—the Rockland 6-piece microfiber power-reclining sectional sofa has the patina of distressed leather but is actually upholstered in soft polished microfiber. Push-button power reclining offers infinite positions and the chaise style provides a continuous seating surface for outstanding support. Drinks won’t spill with the console’s 2-cup holder, and flip-top storage adds convenience. The Rockland 6-piece sectional sofa is everything you need for relaxed living. Leather-look seating with easy-care fabric—the Rockland 6-piece microfiber power-reclining sectional sofa has the patina of distressed leather but is actually upholstered in soft polished microfiber. Push-button power reclining offers infinite positions and the chaise style provides a continuous seating surface for outstanding support. Drinks won’t spill with the console’s 2-cup holder, and flip-top storage adds convenience. The Rockland 6-piece sectional sofa is everything you need for relaxed living. 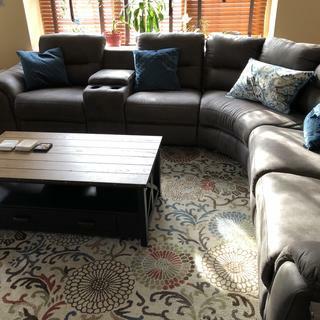 L: 36.5" x W: 15" x H: 32"
L: 36.5" x W: 27" x H: 39"
This sectional is stunning and looks very nice in our living room, however, the more we sit on it the less comfortable it gets. When you recline on the couch there is a big gap and the wood hits your back if it is reclined all the way. It's also a pain waiting to get up from the reclined position due to the power incline. I feel the do it yourself way is more efficient! Also the cup holder has lost the silver color around it and that happened within the first few days. We are not abusing the couch and have barely used the cup holder so I don't understand why the paint is not sticking. The couch does not stay together nicely too! The idea and look of this sectional are great, but when you don't enjoy sitting on the couch...looks just don't matter! Comfort & Style & A Great Deal! This Rockland Microfiber Power Reclining Sectional Sofa w/ Storage meets comfort with style, like no other! Super plush cushiony seats, with extra support (almost spring like-which helps you get out)! I have napped 2x's in the recliners now, and what a wonderful sleep it was! Great color, almost a charcoal or gunmetal gray. Goes perfectly with my steel blue walls in my home! The fabric is so soft, and so comfortable, and seems very durable ( I have to Dachshunds that love to 'lick' things and it has not shown any signs of their weird habit)! This sectional not only has power reclining, but there is a USB port right next to the controls on each armed recliner! SUPER easy to put together, except ( and this has been the only downfall) the one arm chair has not reclined since we got it and no one has yet to contact us about replacement. That will not affect my review, though, because I am SURE they will remedy the situation, these things happen after all. Fabulous product, we could not be happier! Very uncomfortable couch! I was very excited to get this and was very disappointed at how uncomfortable it actually is. Feels like I am sitting on styrofoam. For over $3000 with delivery and warranty I am very unsatisfied. It is very nice looking though. The furniture is very comfortable. The service in the store and delivery men was excellent. Hope to enjoy for a long time. We ordered the 6 piece version with 3 recliners. So far we are impressed with the mechanics and fabric. We have only had it for a week now, so another long term review would be more appropriate. Overall for the price we would recommend to others! Our sectional fits nicely in our new family room. Comfortable and good looking is the description we will give it. We've had it less than a week however. We enjoy the power recliners. Being able to adjust recline positions is much nicer than having only 2 on regular ones. Saleslady was great, manager was great, and the delivery men were wonderful as well. This was amazing. Delivery was prompt couch is stunning. One of the top sectionals we've ever bought! we purchased the 6-piece set with three power recliners and storage bin and couldn't be happier. It's comfortable and looks great in our new den. Modern, yet traditional all in one. This couch is so comfortable! The microfiber has a leather look but is so soft. With the versatility this line offered, we were able to create the perfect sectional for our new great room. Comfortable and casual! I’m sure we’ll love it once we get to relax! Beautiful sturdy and super comfy couch! We love the power recliners! We are loving our new sectional. It is incredibly comfortable and the power recline is so smooth and easy. Also the cup holder and storage piece is super convenient. Just purchased my home we have basically done our entire house with Raymour and this couch if my favorite spot. Solid construction and a wonderful color. We search other places and feel in love with this piece. See you again Raymour once we get to the next room. I am totally in love with my set. It's comfortable, soft and all my family likes them.I'm very happy with my selection. Well constructed and pleasing to the eye. I buy all my furniture at raymour. Great warranty service too. can i add another armless seat onto right side? BEST ANSWER: You can add another armless seat to make the configuration of your choice. Please call Online Sales at 866-383-4484 option 3 for assistance. Yes. You can get the 7 piece and each section will unhook and let you arrange each piece how you want it. On the wall the price says $1788 on sale, why does it showw more here? BEST ANSWER: Showroom and online prices are the same. Please call 866-383-4484, option 3 for assistance. You have differant options to buy with this sectional. You can choose if you want two or three sections that recline. You have to read the features to find out which is which and the more that recline, the more the price goes up. Can I just purchase console? BEST ANSWER: We do not sell individual pieces online. You can order the console through our sales team. Please contact 866-383-4484, option 2 for assistance. This sectional is a little big for my space. I want to take out one part of the sectional and use it as a single chair. Are there flaps or anything of that sort that I can buy to cover the sides? BEST ANSWER: The Rockland collection does not offer covers for the sides of the individual pieces. What is the height of the legs, are the legs replaceable? BEST ANSWER: The legs measure 3" H. There is not an option to replace them. How easy is it to clean off pet hair? BEST ANSWER: Microfiber is a very tightly woven fabric of 100% polyester, is very durable and easy to care for. Pet hair will sit on top of the fabric and can easily be brushed or vacuumed. Can i put the storage on the other side of the sofa? BEST ANSWER: Yes. The sectional can be configured with the console on the opposite side. I own this sectional. Where are the 2 USB charging ports on this sectional? Where is the remote with battery back-up and what is it for? I don't remember seeing a remote when I received the couch unless it was taped to the power plugs which the installation/delivery team plugged in and I didn't make a point to look at. BEST ANSWER: The USB charging ports are in the console. For assistance with a remote, please contact Customer Service at 866-383-4484, option 2. Does this product come in other colors? BEST ANSWER: The Rockland is available only in the color shown.